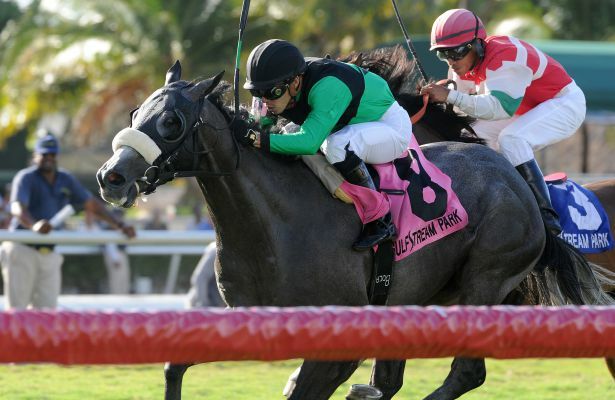 Days after Midwest Thoroughbreds Inc. retired multiple Grade 1 stakes-winning turf star The Pizza Man, Kroy came through for Richard and Karen Papiese’s stable with a stakes victory in Saturday’s $75,000 Tortugas Stakes at Gulfstream Park. Although a horse like The Pizza Man comes along once in a lifetime, Kroy nevertheless stamped himself as a horse with a bright stakes future with a professional three-quarter length victory in the 7 ½-furlong turf feature. Equipped with blinkers for the second straight race, the gelded son of The Factor made it back-to-back victories while prevailing over seven other 3-year-olds. While Kroy ran away to a 7 ¼-length triumph with a front-running optional claiming allowance score July 29, he stalked the early pace set by longshot Racing’s My Game before advancing on the turn to take the lead in the stretch and holding off the late charge of Love Conquers. The even-money favorite ran 7 1/2 furlongs in 1:28.21 to prevail over Love Conquers, who finished 1 ¼ lengths ahead of He’s the One. De la cerda said Kroy will be pointed toward the $100,000 Bear’s Den for Florida-bred 3-year-olds at Gulfstream Park Sept. 23. “This is a nice horse. He can run anywhere in the United States, not just Florida,” De la cerda said.